Two women, Fabiana Cecchino (35) and Serafina Giovanna Valentino (33), had a vision of Mary first as the Pieta and later as Our Lady of Sorrows in a cave at Castelpetroso, Italy. On the day before the Feast of the Compassion of Our Blessed Lady, two country women belonging to Pastine, a hamlet in the diocese of Bojano, in Southern Italy, were sent to look for some sheep that had strayed on a neighboring hill, to which Castelpetroso is the nearest village. One was named Fabiana Cecchino, a 35-year old virgin, and the other Serafina Giovanna Valentino, a married woman a little younger. Before long they returned home, crying, sobbing, trembling, and terrified. People naturally inquired into the cause of their emotion. The women reported that they had seen a light coming through some cracks in the rocks; and when they came closer they saw distinctly the image of Our Lady of Sorrows. She was a very beautiful, fair skinned young woman with disheveled hair and bleeding from the wounds received from seven swords. No one paid much attention to these statements, which were looked upon as absurdities ; but further evidence was forthcoming. First of all a child and then an avowed heretic gave testimony to similar apparitions. People began to go to the mountain and visit the spot of the alleged apparitions, some 2,600 feet above the sea-level; and some affirmed that they saw Our Lady bearing in her arms her dead Son. Pilgrimages began and within a few days some four thousand persons visited the spot, that is, double the number of those living there; and soon a place which had been generally unknown, suddenly became the center of attraction to countless crowds from the neighboring country. a well-known disbeliever, who received the grace of seeing Our Lady four times in half an hour. After some time, news of the occurrences reached Mgr. Macarone-Palmieri, Bishop of the diocese of Bojano where Castelpetroso is located. He was called to Rome by the business of his diocese, and while there updated the Holy Father on what was going on at Castelpetroso, adding that he should have liked the apparitions to have been confirmed by some clear sign. The Pope replied by asking whether he did not think the apparitions in themselves were signs; and requested the Bishop to return to his diocese, visit Castelpetroso, and report again. The Bishop did as he had been directed. He visited Castelpetroso, in company with the archpriest of Bojanoand and saw Our Lady three times. Read the official statment of the Bishop. A spring of water appeared on the spot. The Bishop of Bojano mentioned the presence of the spring in a letter addressed to the editor of the Servo di Maria. This water has been used by the faithful in the same manner as that of Lourdes, and many favors are piously believed to have been received in consequence. Father Joseph Lais of the Congregation of the Oratory of St. Philip Neri a physicist and in medical doctor, sub-director of the Vatican Observatory, examined everything was soon convinced that optical delusion, at any rate, was out of the question. He then proceeded to examine the evidence. The Bishop of Bojano formed a committee, of which he took the post of president, for the purpose of collecting funds to build a church on the spot hallowed by the presence of Our Lady ; and he has determined to place it under the care of the Servite Order, founded, as our readers are aware, for the express purpose of honoring Our Lady of Sorrows. The Holy Father deigned to bless the work, and sent a telegram, through Cardinal Rampolla, his Secretary of State, imparting the Apostolic Blessing to the members of the committee, and to all those who contributed to the fund. The cornerstone was laid for a beautiful Gothic church later built on the spot where the Blessed Virgin appeared. The March 22, 1888 Molise, Italy, two peasant appears in Castelpetroso, Bibiana and Libera. In front of a small cave, including flashing lights, saw the Virgin with Jesus dead, covered with sores. Mary was silent and painful attitude, almost on his knees, with outstretched hands and eyes raised to heaven in prayer. Bibiana was on his way to a place called Santi Cesatra where the family had a small plot of land. At first his mother was not convinced to let her go alone and that there were many wild wolves in that area. Bibiana brought his cousin Libera and armed with a rake would also help you prepare the ground to plant it in the spring. On the morning of March 12, as was the custom, took a group of sheep to graze while working the land. Around 3:00 pm they realized that the sheep had been lost sight of. While looking passed through a small cave whose opening saw a beam of light out. The entrance to the cave was so small that they could not enter. Vivian was surprised and alarmed, but full of courage to look more closely at what was happening. The fissure in the rock was bathed in light. Ten days later, on March 22, 1888, full of curiosity and with the excuse to continue cultivating the land for planting got permission to go alone to the top of Mount Patalecchio. As soon as he ceases to tra Santi, Bibiana was the rock and saw, as before, that was lit inside. He approached and kneeling, with much fear of the unknown, his hands tried to enlarge the crack to see better. It was then that, for the first time could see the image of the Mother of Sorrows with the dead body of Jesus to his feet. The Sorrowful Mother was with one knee on the ground, in adoration, his head facing the sky imploringly and tears fell from his eyes, his hands, palms directed skyward. The Virgin Mary wearing a purple veil on his chest and his heart pierced by seven swords looked. Bibiana hurried back to his eager to share this experience with your family home. They were not impressed nor excited and believed that she had hallucinated. After all, they reasoned, that has previously occurred under the same conditions. But when people were nearby heard what happened in haste went to climb the cave to see with their own eyes. A reporter from the Sicilian newspaper reported that 4,000 people made their way to reach the small mountain that was previously unknown days. He marveled that before the appearance to the most famous geographers have had difficulty trying to find on the map Castelpetroso more Detailed Italy. In Bologna, Count Carlos Aquaderni, editor of "The Servant of Mary", began writing a series of articles based on the reports Castelpetroso priest, Father Achille Ferrara, constantly sent. Decided to investigate for himself, took his son Aquaderni 19, Aquaderni Augusto, who suffered from bone tuberculosis, a disease that was incurable in those days. Both expected a miracle. Aquaderni knew about the cave had appeared a small pool of water that was miraculous, in fact, a child of Abruzzi who was deaf and dumb was healed. With strong faith, Carlos and his son went to the cave and the two were favored seeing the emergence two days. 's son reporter was cured using water from the pool. Aquaderni reported miracle in your magazine and appealed to A chapel was built in the place which the Sorrowful Mother had chosen to be venerated. When the local bishop, Francis Palmieri, learned of the onset, took the advice of Pope Leo XIII, conducted research and interviewed Bibiana seer. Bishop decided to go to the mountain itself, arriving he found about twenty people knees praying. His Excellency took a candle to explore the cave but found that there was no need because the light was lit cave. Looking inside he saw the Mother of Sorrows and Christ died to Bibiana and Bologna journalist had reported . Moved by such a scene, the bishop spoke to the pilgrims on what he had seen and all broke to mourn. Bishop Pope Leo XIII assured that everything was in order and that Castelpetroso apparitions of the Mother of Sorrows were true. "I can also testify that the address that holy place, while I was absorbed in prayer, I experienced the apparition of the Virgin. 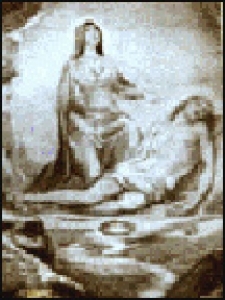 He appeared with the attitude and the greatness of the Sorrowful Mother as shown on the cover of this volume of "The Servant of Mary." There are many other testimonies besides mine therefore consider it my duty, as bishop of this diocese, I associate myself with her and extend a fervent request to all devotees of the Virgin Mary, who with their generous donations make possible the construction of a chapel or oratory in place that is sacred and the hope that one day with the help of Divine Providence to become a world-famous basilica " . Interestingly, usually Our Lady appears to privileged souls whether children or shepherds, but Castelpetroso appeared to people of different classes, pastors, clergy, royalty and wealthy and others. Castelpetroso Basilica of Our Lady of Sorrows is of recent origin (XIX century) and is in the custody of the Franciscans of the Immaculate. The beautiful church in neo-Gothic style is becoming more known for being half way between Rome and San Giovanno Rotondo, the tomb of Blessed Padre Pio. It was designed in the form of heart, has seven chapels surrounding the nave, each representing the Feel Pain sword pierced Mary's heart. The Chapel of Our Lady sixth pain has special significance because it represents exactly the appearance there in 1888 to Pastor Vivian Ciccino. She saw this image of Jesus placed in the arms of Mary. Started work Aquaderni grateful Conde, who appealed for the construction of a temple to all the devotees of the Sorrowful Mother. In early February 1890 Bologna Gualandi Francis presented the project and on 28 September the same year the ceremony of laying the first stone of the majestic sanctuary came, attended by 30,000 faithful. The work was done for a century, with the generous offerings of the faithful, Italians and foreigners. In 1931 the bishop Romita orphanage founded the Sanctuary. The December 6, 1973, at the request of the Bishops of Molise, Pope Paul VI proclaimed Patroness of the region to the Blessed Virgin Mary of Sorrows. The consecration of the new church took place on September 21, 1975, by the prayer of consecration of Archbishop Carinci. A painting on canvas, 1890, the painter John Gagliardi of Rome, shows the appearance described. The painting preserved in the Sanctuary is the first sign of Marian devotion Castelpetroso. 1778 pipe organ work Ruffatti brothers Papua remains. In one of the seven side chapels there an artistic reliquary containing a tooth of St. Gabriel of the Sorrowful Mother. The October 12, 1980, provided in Castelpetroso (IS), Molise consecration to the Immaculate Heart of Mary was made. The March 19, 1995 was visited by Pope John Paul II, as a pilgrim. Today when you see the great basilica of the Seven Sorrows of Mary in Castelpetroso, it is clear that the bishop's request was taken seriously by many generous Catholics. Pilgrims find, besides the beautiful sanctuary, monasteries for the Franciscan Sisters of the Immaculate, Friars of the Immaculate in charge of the basilica, a Marian bookstore and a gift shop, a small orphanage for girls and an auditorium for conferences Marian . There is also a hotel and restaurant for the pilgrims at the foot of the mountain. To reach the cave climbing the sloping steppe. The small slot through which Vivian, Carlos Augusto Aquaderni Palmieri and Bishop could see the apparition of Our Lady of Sorrows is protected by a wooden structure. The area around it retains the rustic appearance when the apparitions began over a hundred years ago. In the area of the basilica surrounded by trees is a beautiful sculpture made according to the testimony of the visionaries. What is the message that the Virgin Mary, Mother of Sorrows, wants to impart to their children?. He said no word but looking at the image is not necessary. This scene alone is a rich and profound theological dimension. Mary resting on one knee recognizes the divinity of his Son. Its painful and heart pierced by seven swords and tears running down her cheeks emphasize the price paid for accepting the vocation of co-redeemer, next to her Son Redeemer, for the salvation of his spiritual children. The dead body lying in the mantle Redeemer price attests that God made His Son to pay for the remission of sins and satisfaction in the world. The hands of the Madonna directed and open to the sky signify the perfect offering to the Father in his plan to redeem the world chose the bitter Passion and death of her Son. In 1975, during an ad limina visit of the bishops of the province of Molise (where Castelpetroso is located), was given to Pope Paul VI a small replica of the statue of the Sorrowful Mother. Examining the statue near the Holy Father exclaimed spontaneously, "That looks the Co-redeemer." There is a nobility in the form and features of the Sorrowful Mother, who not only gave the fiat of his heart, but he gave all his heart . The women reported that they had seen a light coming through some cracks in the rocks; and when they came closer they saw distinctly the image of Our Lady of Sorrows. She was a very beautiful, fair skinned young woman with disheveled hair and bleeding from the wounds received from seven swords. that time forward when I have heard a mention of that thrice- blessed mountain and of the Apparition I have felt myself moved to tears, and have not been able to say a word." This testimony was authenticated by the signature of Don Luigi Ferrara, the priest in question. After some time, news of the occurrences reached Mgr. Macarone-Palmieri, Bishop of the diocese of Bojano where Castelpetroso is located. He was called to Rome by the business of his diocese, and while there updated the Holy Father on what was going on at Castelpetroso, adding that he should have liked the Apparitions to have been confirmed by some clear sign. The Pope replied by asking whether he did not think the apparitions in themselves were signs; and requested the Bishop to return to his diocese, visit Castelpetroso, and report again. The Bishop did as he had been directed. He visited Castelpetroso, in company with the archpriest of Bojano, on September 26, 1888, and saw Our Lady three times. The Vicar-General and many other clergy of the diocese were no less favored; but perhaps the most remarkable evidence of all was that rendered by a man who believed neither in God nor Saints, though he frequented the Sacraments out of human respect. This man, who had been leading so miserable a life, went to Castelpetroso, saw the Blessed Virgin, and was converted. examined everything, and Father Lais was soon convinced that optical delusion, at any rate, was out of the question. He then proceeded to examine the evidence. "The observations I made of the character of the people lead me to recognize that they are profoundly convinced of the event having taken place; and, on the other hand, their simple and ingenuous demeanor does not suggest the suspicion that the fact should be, to some extent, fanciful or the effect of the imagination; whilst the natural formation of the rocks excludes the theory of trickery." Father Lais saw nothing himself ; in fact, the apparitions ceased for a time, though new ones are reported in Il Servo for June, 1890; but, short of personal ocular experience, he could hardly have given stronger reason for believing in the truth of the statements made by those who verify that they have been blessed by the sight of God's holy Mother. And, to give full force to his judgment, it must be remembered that not only is he a stranger in the district, and not a member of the venerable Order devoted to the service of the Our Lady of Sorrows, but he is a man of necessity accustomed to weigh evidence, and one who, from his training and skill in physics, must be naturally inclined to look for physical explanations of matters of this kind.